Saturday September 12th it is was warm at Hilgard Junction. 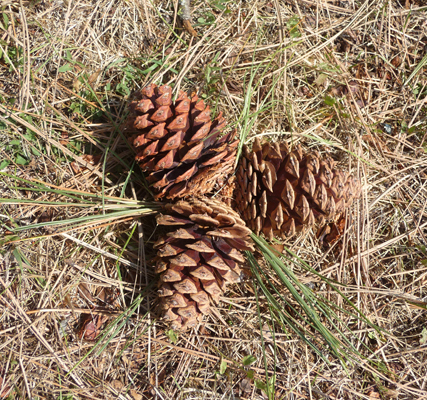 We spent an hour or so picking up pine cones over in the Day Use area across the road. 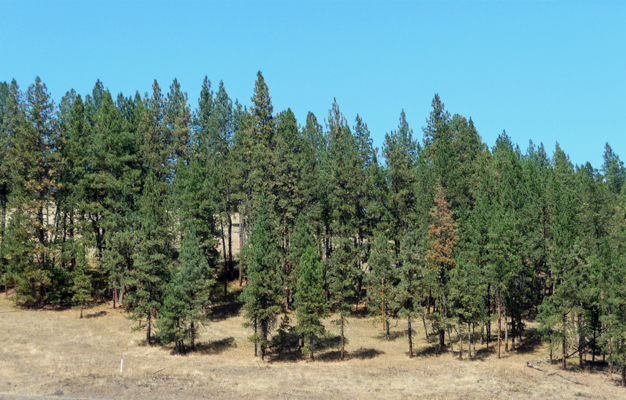 Most of these are Ponderosa pine cones that the Douglas squirrels are busy trying to eat the pine nuts out of. In the process sometimes they cut off more than they can chew. Sometimes there are just the ends of the branch and no cones attached. 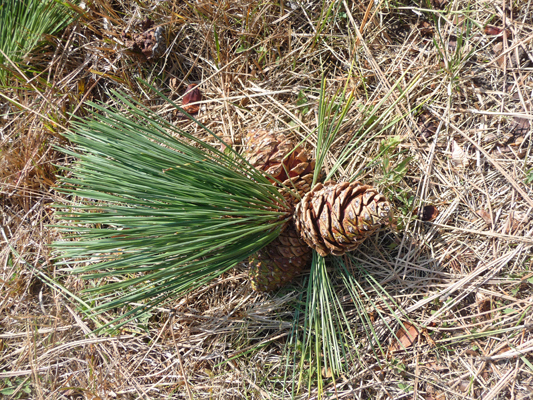 And sometimes we hit the jackpot and get pine needles and cones all together. It wasn’t that warm while we were working but by mid afternoon it had warmed up to 93. 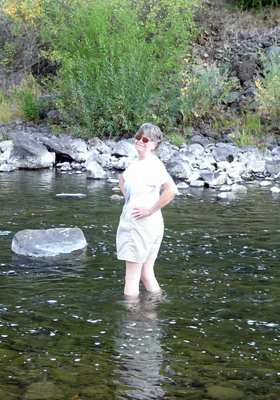 I decided now was the time to figure out how deep the river actually was. I waded out across the algae coated rocky river bottom in my water shoes and shorts until I got to the deepest spot I could find—not even knee deep. The water was cool but not cold and very refreshing on a hot day. 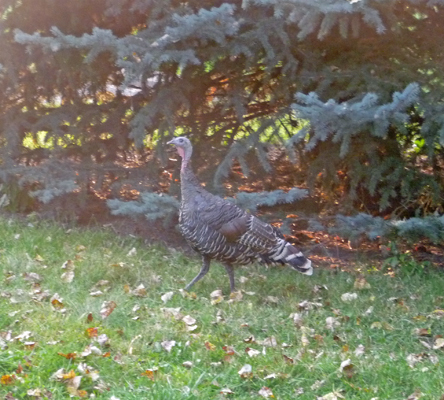 Late in the afternoon the wild turkeys came through. One of them had caught a snake and the others were chasing her. 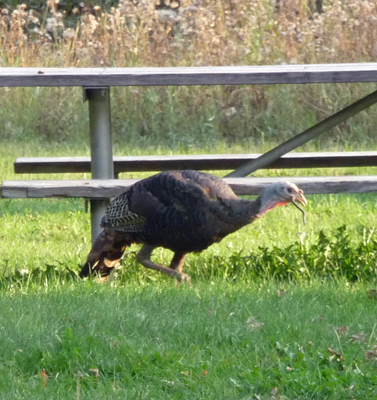 She’d gobble it up and then part of it would show up again hanging out of her mouth. It took a while but she finally got it all down. Once the snake had been fully swallowed, they wandered across the road to right outside our door. We’ve decided that this must be the mother of the brood. We didn’t see them for a few days and were worried. We found a cluster of tail feathers over in the day use area—not a good sign. 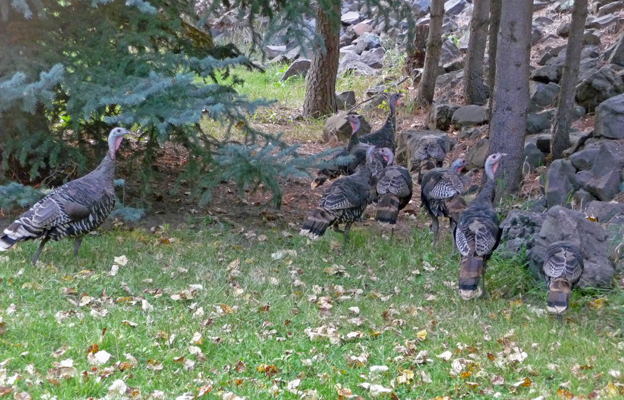 But then all nine of them showed up again so all is well on the turkey front. Saturday evening we got to break the news to some campers that no they still couldn’t have a wood fire to cook their dinner on. They went into town and got some charcoal to use in the fire circle and ended up having to put their tent up in the dark. Sunday I got out the tripod and set things up so we could take a photo with our personalized Park Host sign. Now don’t you want to stop and ask these people a question or two? It was still warm on Sunday but by mid-afternoon the clouds started to come in and it cooled off. By Monday it was cloudy and the temps had dropped into the 60’s. Monday morning, September 13th, Walter’s old friend, Dave Munger, stopped by with his brother. They were on a tour with their Harleys that took them right past our campground! He’d sent an email the night before to say they were coming so it wasn’t a total surprise. But it sure was fun to see him. 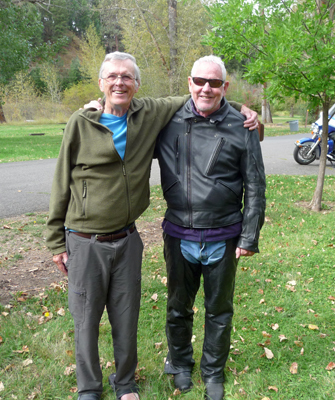 They’ve been friends for 30 years but Dave lives over in Chelan now so we don’t’ see him often. After we’d done our chores for the day, we drove down to explore the historic bridge that there are signs for just one exit south of us. 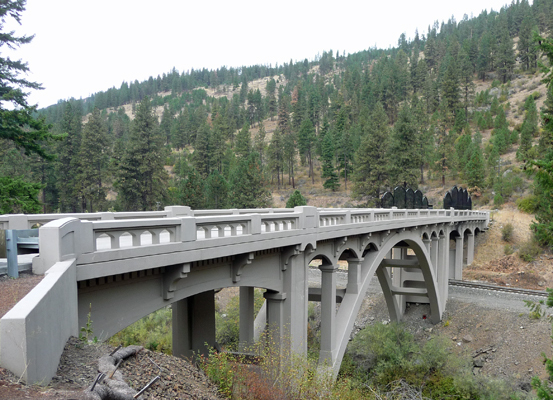 It turns out to be a restoration of a bridge built in 1924. There were a number of lovely arch bridges built in that era with the hopes of attracting more tourists. Here’s the Upper Perry Arch Bridge from east side. The bridge began to decay in the harsh weather here and instead of replacing it with a modern new bridge they decided to restore the old one. They put up nice historical signs to tell you about the bridge’s designer, Conde B. McCullough, and his ideas about bridge building. There’s a nice turn out where you can get a decent view of the Upper Perry Arch Bridge from west side too. For our outing this week we took The Grande Tour driving tour. It takes your on a lazy 8 drive through the countryside and small towns of the area. I drove as Walter read the driving instructions. It was like a cross between a road rally and a scavenger hunt. We only missed a couple of turns and always managed to find our way back to the route but it wasn’t easy. We wandered past the Ladd Marsh Wildlife Area but never found the turn off to the wildlife viewing area. We saw an egret out in one of the ponds but not a lot of other birds. We took a gravel road out to Hot Lake Springs. The lake was steaming at one end. There had been a big spa here from 1908 to 1931 where people came to take the waters. It’s going through a gradual restoration now. We didn’t stop and explore the old brick buildings but at least part of them seemed to be open. 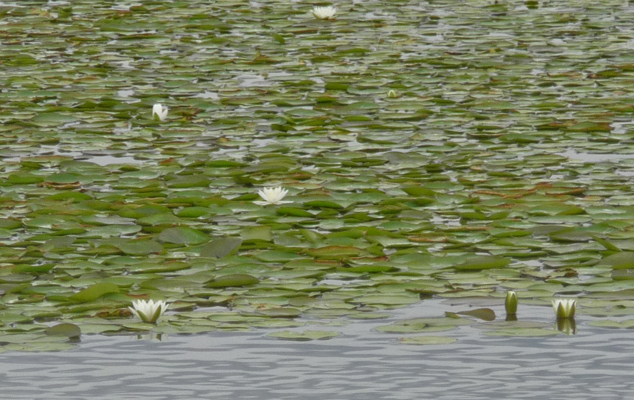 The lake is warm enough that there were white water lilies in it rather than the usual yellow natives. We looped through a great deal of farm land and took a wrong turn down to Thief Valley Reservoir which was basically a mud flat with a creek running through it at this point. You could see that normally it would have been a good sized reservoir but with the drought it was empty. 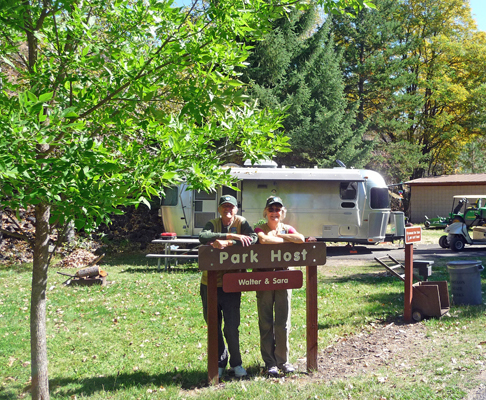 We came back up through the mountains and stopped at Catherine Creek State Park—another small ‘satellite’ park like Hilgard Junction. It has 20 sites and two large Day Use areas. The host’s site is right next to the highway--ugh. We’d talked to the fellow who was host there last month and he said it got pretty busy on the weekends. 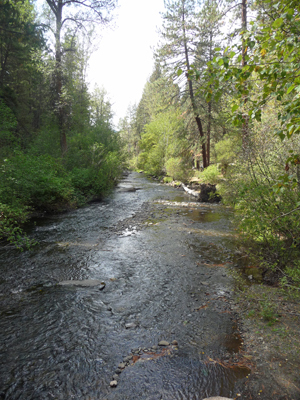 You can understand why since the campsites are in amongst a big stand of Ponderosas so there’s shade and lovely Catherine Creek is nearby to play in. However it’s out in the middle of nowhere with no cell service whatsoever and nothing much in the nearby (20 miles = nearby) town. Even with a couple of sun breaks neither one of us was drawn to stop for lunch here. 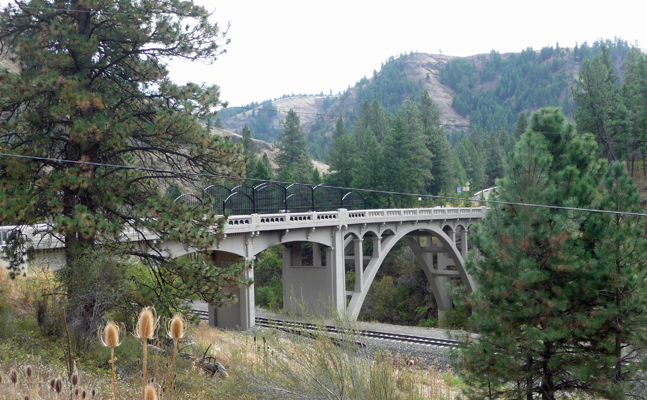 Instead we drove on, hugging the foothills on the east side of the Grande Ronde Valley, through the little town of Cove and then back across the valley towards La Grande. 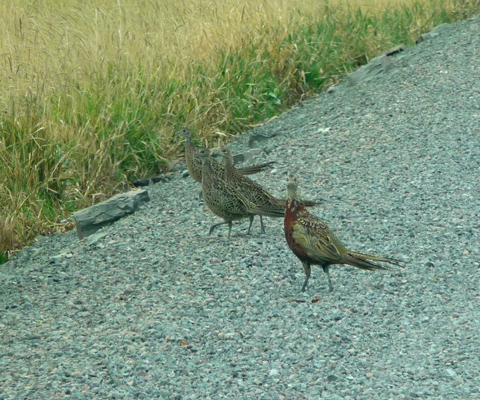 Along yet another gravel road we were met by a large number of pheasants standing in the middle of the road—there were at least 12 to start but some of them were smart enough to fly away as we approached. The rest just slowly made their way across the road and back again. I took this close up to be sure that they were indeed pheasants. As we started to drive on the others who had flown off joined these on the south side of the road. 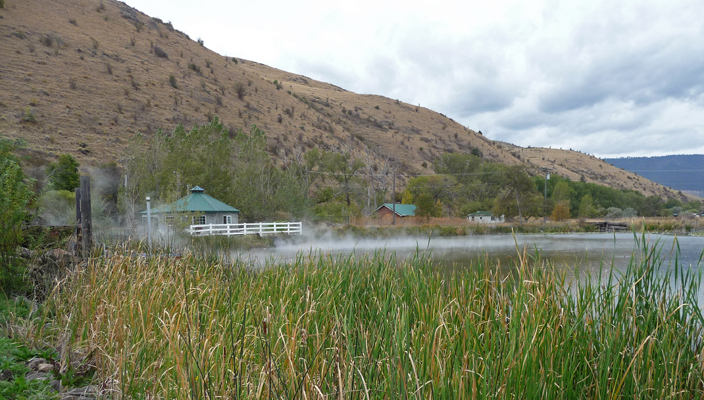 We finished up the tour with lunch at the Riverside Park in La Grande. It was an okay way to spend the day but I wouldn’t suggest it if you were just passing through. We spent a great deal of time looking at all the different kinds of fences folks can put up to keep their cattle in. It would probably have been prettier in the spring when it was green but now all the grass has dried to a light brown and we’re not getting much fall color yet. Wednesday was errand day in La Grande. It’s nice that it’s not far into town to do the shopping and laundry and make a few cell phone calls. Thursday morning we had time to pick up a couple of buckets worth of pine cones before it started to rain. Temperatures were in the mid-50’s so it was kind of cold riding around in the golf cart so we went and huddled inside instead. Every time the sun broke through it was followed by a shower so we eventually gave up on doing outside work. Late in the afternoon the ranger stopped by to let us know that the burn ban had finally been lifted. Campfires are now allowed in our park. So we went out and took down the no campfire signs and loaded up the little bit of campfire wood that had been left in our fire circle and put it in the little wood cart so that anyone who wanted a fire could have one that night. One of our campers took us up on our offer and made a fire. It just seems so much more like a campground when you can smell wood smoke and see a crackling fire in the fire circles. 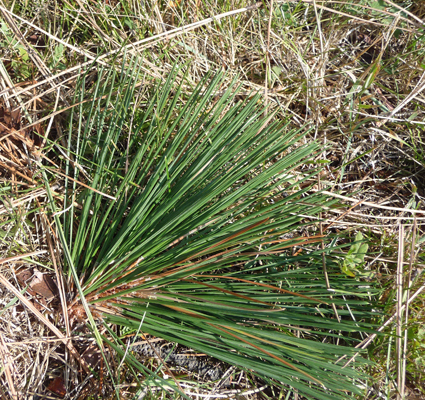 It was sunny on Friday September 18th and we got out and raked pine needles off the road in the Day Use Area. This is a continual task since the trees just keep dropping needles. At this point though, we can just pull a rake along the edge of the road and then load them up in a bag. It didn’t take long to fill 2 1/2 bags worth. While we were doing that, the ranger stopped by to say that he’d dropped off a pile of wood for us for wood sales. It’s not a big pile but it will probably last us until the end of the month. 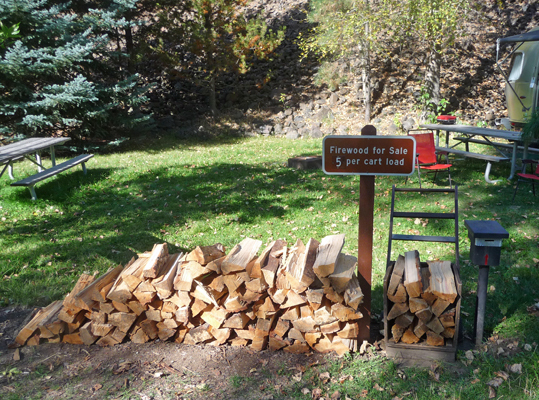 You get all that wood that’s in the little cart for just $5. Such a deal! And the cart has nice wheels so it’s easy to trundle you purchase back to your campsite (and of course bring it back when you’ve unloaded it). Our job is to keep the cart full! Since it was a nice day with temps in the low 70’s we decided we’d take the walk on the old gravel road across the river from the campground. It’s closed off with a gate but it’s part of the park and open to hikers. We strolled along the road following the river until the road turned right and the river turned left. The road ended not much further on at a gate with no trespassing signs. 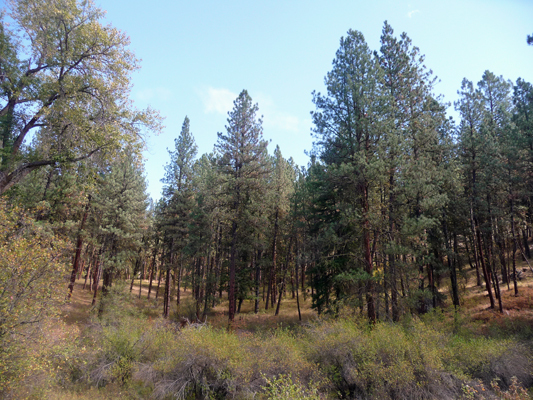 The 516 Ranch starts here and you can rent it out for private hunting if you want. 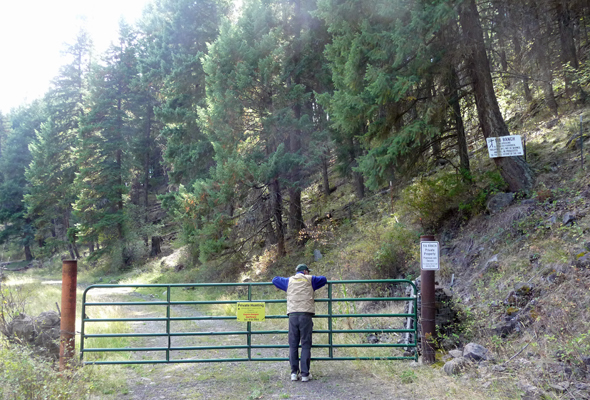 There’s a sign at the end of the campground loop that talks about the Oregon trail coming over the hill ‘over yonder’. We’d been told that you could see white markers marking the trail from this road. And when we spied two of them at once we knew we’d found the hill ‘over yonder’ which just happens to be across the freeway! 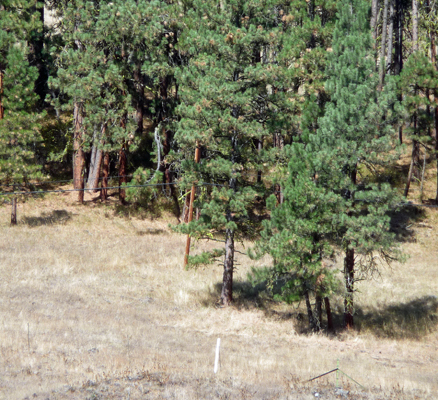 The white marker in the foreground at the bottom of the photo marks the trail. We spied a second on over in amongst the trees on the right. So the trail came over the hill and through Hilgard Junction itself. It was known as a good place to spend the night since there was water and shade—and it still has water and shade and people view it as a good place to rest for the night. 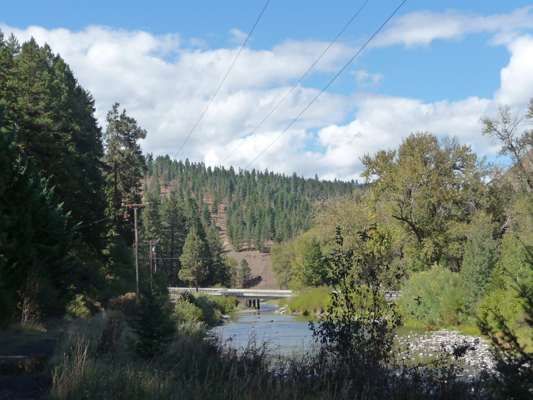 I stopped and shot this photo of the Blue Mountains and the Grande Ronde River as we neared the bridge over the river at Highway 244. 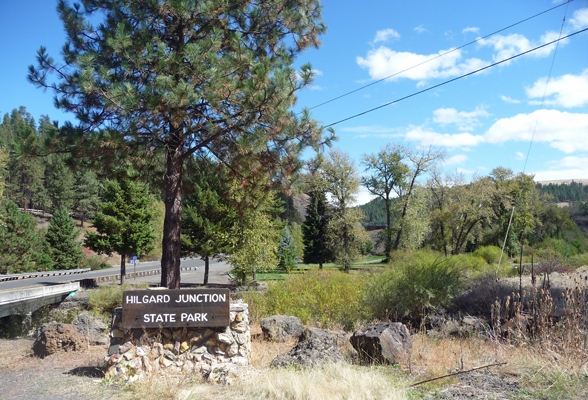 When we went to drive back to the trailer I spied this nice Hilgard Junction sign near the bridge. I suspect there used to be one of these on our side of the river too but for some reason it’s gone. The long term forecast has it sunny and in the 70’s for the next week or so. We may hit 80 on Sunday and then again maybe not. The days are getting shorter fast now and the hills on both sides of the river make for a lot of shade this time of year in the park. Some days we actually get to play camp hosts and answer a question or two but mostly it’s very quiet here. 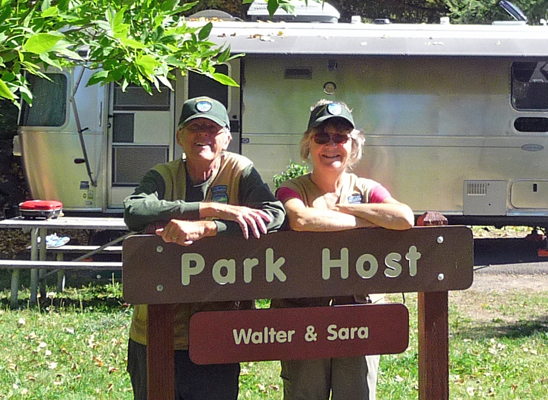 We’re averaging 4 camping parties per night—most of them RVs. This is much more like a caretaker position than a camp host position and now that we’re getting used to the slow pace it’s not too bad, just a little boring is all.